Tax 2290 Online & Get IRS Schedule 1. Online 2290 Tax Filing in Minutes. IRS Approved - Free Registration. Did you miss August 31st deadline, no worries you can still file Online. at 55,000 pounds or more, filing heavy vehicle use tax Form 2290 is required. Tax 2290 online tries to take away the stress and confusion of filing your IRS form 2290 online by providing a simple step-by-step online filing guide and by offering live Chat support and Phone Support. Transactions on Form2290filing.com are protected with up to 256-bit Secure Sockets Layer encryption, the highest level or we can say Bank level Security. Its easy to file Tax 2290 online for 2018. Get-started with a free account or log in and enter your 2290 Business Info, adding your EIN and Vehilcle Info. tax-2290online.com caluculates your 2290 tax for 2018. 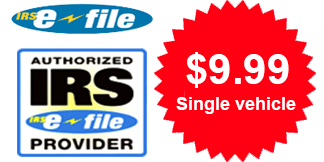 Tax 2290 Online filing system is capable of file 2290 online on any another computer or any another device without any change. Tax 2290 Online stores efile form 2290 online data in cloud, it is a cloud computing model in which data is stored on remote servers. Tax 2290 Online filing has Smart Access for authorization of file Form 2290 Online that which is available as an option or standard used. Tax 2290 Online filing stores file 2290 Form data in cloud, so you will have access of retriving data from any device and from any where. Tax 2290 Online filing offers Bulk VIN upload feature while filing Form 2290 Online, so you don't have to enter VINs manually. Tax 2290 Online suports IRS Audits. If you file form 2290 online on 2290tax-online.com and if at all you receive notice we will assist you in collecting documents. Form 2290, Heavy Highway Vehicle Use Tax Return. Form 2290 used to Figure and pay the tax due on highway motor vehicles used during the period with a taxable gross weight of 55,000 pounds or more. Figure and pay the tax due on a vehicle for which you completed the suspension statement on another Form 2290 if that vehicle later exceeded the mileage use limit during the period. Figure and pay the tax due if, during the period, the taxable gross weight of a vehicle increases and the vehicle falls into a new category. Claim suspension from the tax when a vehicle is expected to be used 5,000 miles or less (7,500 miles or less for agricultural vehicles) during the period. Claim a credit for tax paid on vehicles that were destroyed, stolen, sold, or used 5,000 miles or less (7,500 miles or less for agricultural vehicles). Report acquisition of a used taxable vehicle for which the tax has been suspended. Figure and pay the tax due on a used taxable vehicle acquired and used during the period. TAX 2290 ONLINE DUE DATE? Pay 2290 online for the month you first used the taxable vehicle on public highways during the reporting period. Form 2290 filing and paying tax 2290 online season started in July 1, 2018 through June 30, 2019 and the Due date is August 31, 2018. For vehicles you first use on a public highway in July, file Form 2290 and pay 2290 online between July 1 and Aug 31. 2290 tax for the current filing season will be prorated for vehicles you first use on a public highway after July. File Form 2290 by the last day of the month. 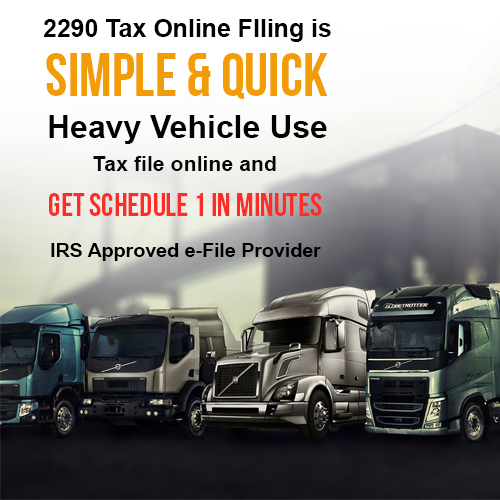 Pay 2290 online and form 2290 filing deadline is not tied to your vehicle registration date. Regardless of your vehicle’s registration renewal date, file Form 2290 by the last day of the month following the month in which you first used the vehicle on a public highway during the taxable period. Did you forget to file 2290 before August 31st deadline, no worries we provide you now the online filing platform to file with IRS. Even you have an option to of filing Form 2290 on paper, Tax 2290 online and IRS encourages filing this 2290 tax form electronically is the best option for getting the IRS accepted stamped schedule 1 instantly. Tax 2290 online filing is the Best Option to Get Schedule 1.